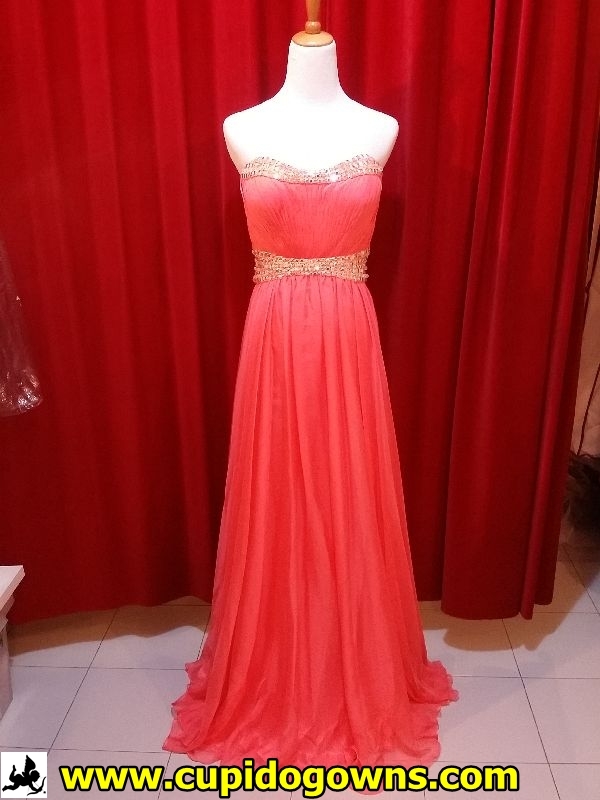 Many of our clients always asked us how many pieces of Evening Gowns that they should be wearing for their wedding dinner banquet in Singapore. In Singapore, the Chinese wedding customary day is always a long day for the wedding couples. The groom would usually do his rounds of gate crashing to fetch the Bride in the early hours. Then the tea ceremony with a slight break in the afternoon for the couple before they proceed to their wedding dinner banquet. The banquet is usually held either at a Chinese restaurant or at a hotel ballroom, serving a nine course meal. At the banquet, the Bride will do her first march in with a white wedding gown to greet the guests. Towards the third course of the meal, the Bride will change into a coloured and elegant evening gown for a second march in. This will be the evening gown that the Bride wears to toast to the guests. After the second march in and the toast, some Brides choose to change into a second evening gown that is less elaborate, to mingle around with their guests. This change is good as the Bride will find more variety when their photographer takes pictures of them. Finally towards the end of the wedding banquet, Bride would change to a simple long evening gown when they greet their guests goodbye. From the sequence of events, usually a Bride would need at least 3 evening gowns just for the wedding banquet. However, modern times now, there is no hard and fast rules on the number. Some Brides prefer photo varieties on account that they have already paid a photographer, so these Brides go for 3 or more evening gowns. There are also a minority group whom prefers to stick with only one throughout the night. Cupido Gowns recommends at least two evening gowns where the Bride first march in with a white wedding gown, then a second march in with an elegant and more elaborate evening gown, follow by a changeover to a simple evening gown to greet the guests goodbye. This order will not exhaust the Bride too much from the changeover yet the variety is adequate for photographs.